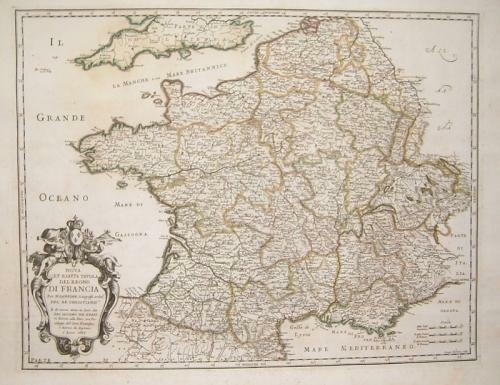 Title: 'Di Francia', from the Atlas La Guida Del Mercurio Geographica per Tutte Le Partie Del Mondo. Dalle Stampe Della Calcografia Camerale a Piede di marmo. 1741. Di Francia N. Sansone. Christianis. Gio Iacomo de Rossi in 1697. Giorgio Widman sculpi. In very good condition with only minor foxing mainly in the margin area and a small ink stain at the edge of the paper (well away from the printed area). Seldom seen on the market.